Here is the summary for yesterday’s Meeting, along with the raw and cleansed chatlogs! Minasunda began the speaker session outlining the events planned for the weekend of the IX anniversary of MO:ULa (from Friday 8 to Sunday 10). There will be music, light shows, dance parties, but also a memorial for the friends we lost along the way. More details in the ☞ dedicated post. Max announced the reprise of his Sunday Music Sessions on Sunday 24, the theme being “From Cover to Cover”. As always, suggestions are welcome! Next, he announced the now traditional celebrations for the International Women’s Day on Friday, March 8: the call is for female D’niJs, or tracklists with female artists, or suggestions for tracks composed, played or sung by female artists. Max concluded mentioning the International Mother Earth Day, which is also fairly close, on April 22. Korov’ev announced the latest overhaul of the Age creation plugin for Blender, released by the Guild of Writers. The new version focuses on improving the existing functions and fixing the occasional bugs. Tweek bore news of the Intangibles project. Specifically, he completed the modeling work on the Gateway Nexus; after some final checks, he will send it to Hoikas and Deledrius for the programming. RAWA (who is still recovering) was kind enough to assist with some of the lore. Second, he announced that the deadline for the submissions for Eder Fahsee has been pushed to March 9, to give people a bit more time. He is asking explorers for chronicles about their first interactions with Myst and the impact it had on their lives. Third, he is going to release an interim build of Fahets, based on the first version but with updated textures and geometry, to bring it more in line with the newer build. Version 2 will make the Age a lot larger. To keep updated on Tweek’s work, check his blog and his Facebook page. Korov’ev announced five more Ages in the works by Writer matthornb: Sevkor, D’ni Temple, Eder Vikae, Nay’elas, and Alepahnay. Part of D’ni Temple (area 1) is already available for offline and online visitors, but will be vastly expanded with areas 2 and 3. You might have heard about Sevkor in discussions about porting fan Ages into MOULa, as one of the proposed ways to access them. Eder Vikae, Nay’elas, and Alepahnay are all new Ages, loosely inspired by old concepts. On top of that, he’ll release a Unity remake of Sehv T’devokan, his standalone game, including a version that can be played in a web browser. He is planning to release them very soon for offline Uru and any shards willing to host them (as Korman allows to easily export for both types). You can read more about matthornb’s creations on his website. rarified gave an update on the status of the OpenUru.org testing shard Minkata. Specifically, he is still trying to find a solution to the Age state retention issue; to this end, he locked down the Vault, so at the moment the shard is unavailable. In the meantime, he has been updating the server to test the latest updates to the OpenUru.org server MOSS. Korov’ev then gave a recap of the last updates from Cyan about the updated Myst games and the physical rewards. The DVDs have all been shipped; those who haven’t got them yet should try contacting support[at]cyan[dot]com. Cyan will reach out to any backers whose DVDs are being returned due to various delivery issues. Inkwells and linking books are being shipped separately; if you receive damaged rewards, or with missing pieces, please contact support and include pictures of the damages. U.S. backers are getting their books and inkwells a few weeks later than other countries; Canadian backers are getting the DVDs later. If you haven’t received them yet, don’t lose hope, and try contacting your local post office. Some backers have reported getting a virus alert when they tried to plug their linking books into their computers. It’s not clear how serious the alerts are yet, and it appears that only specific batches have them. The investigation is still ongoing. Some backers never finished the Blackbox survey, or completed it long after the due date; their rewards will shipped from Cyan directly, but only after all those who did complete their surveys got them. RIUM+ posted a thorough review of the Linking Book and the inkwell. Shokhootahn Rehn closed the speaker session announcing two more students who have completed the 101 class. More groups are still making their way through at various stages. Those who would like to attend the lessons should contact Rehn via PM or KImail (KI# 58324); be sure to include your KI number in the message! Magic Bot is employed to announce last-minute changes to class times: to get notified, add him as a buddy (KI# 27527), then send him a PM with the word “advert”. If Magic Bot is not online, you can send a PM to Mimi Bot (KI# 71459). Story Nights Europe will conclude the events from The Fall. Original Story Nights will continue the events from the Myst game. Due to the IX anniversary weekend, Story Night Europe will be postponed to Saturday 16 at the usual time, barring any last-minute travel plans. The 23:30 events are unaffected, but thunderstorms can cause power outages; in that case, r’Tayrtahn will try to contact someone from the regular audience, so they can relay his situation. Story Nights are held in Tsahno’s Hood every Saturday night, gathering at the fountain at around 23:00 KIT, with the story starting at about 23:30 KIT. For Story Nights Europe, the gatherings are on Saturday starting at 13:30 KIT, with the story starting at about 14:00 KIT. On All Guilds Meeting days, the event will begin at 14:30 KIT or 30 minutes after the end of the meeting. The stories are told using voice chat, so you will need to have your speakers, headphones or KI devices on. If you would like a reminder, please send r’Tayrtahn (KI# 58324) a KI mail with your KI number included in the text; he will add you to his buddies list. And that was it for this month. Don’t forget to donate to keep the Cavern open! 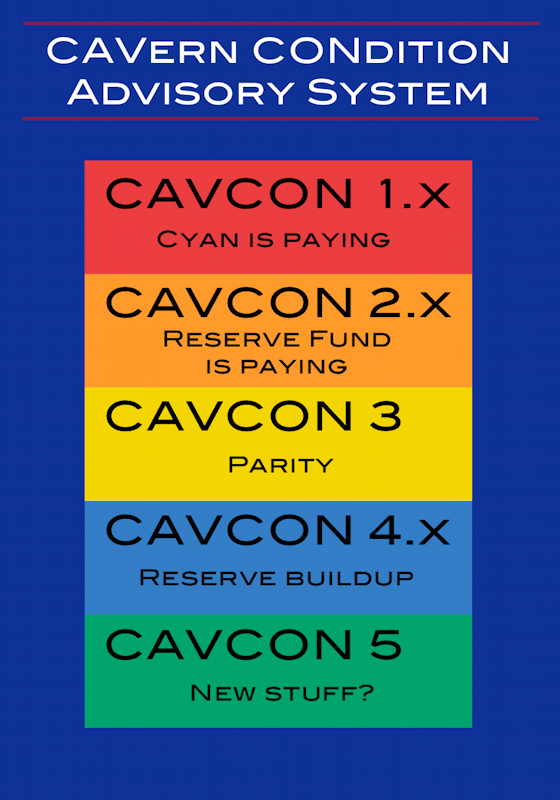 The CavCon status has not been updated yet; internal sources assured that the situation is good, but that can only continue with your help. The next All Guilds Meeting is planned for Saturday, March 2, 2019 at 13:00 KIT. Copyright © 2019 The Guild of Messengers. All rights reserved.